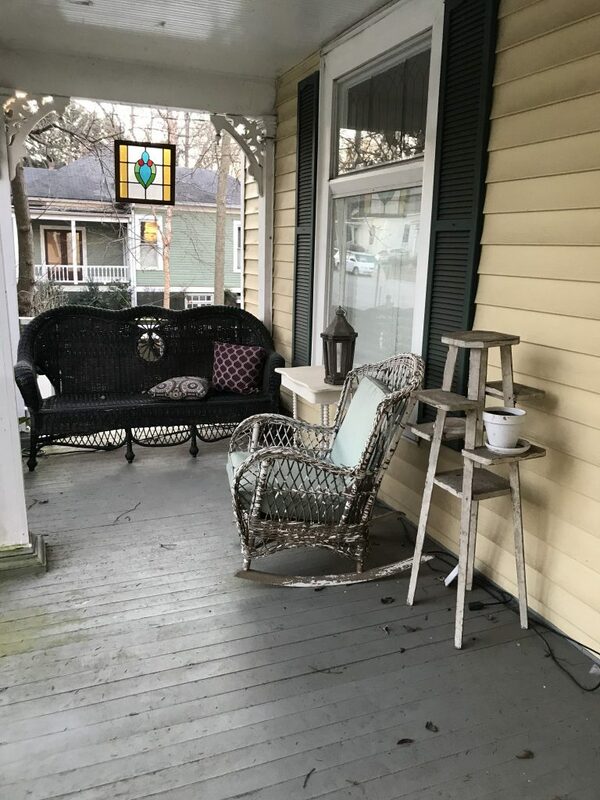 The front porch refresh and makeover is coming along! We don’t know about y’all, but we had amazing Spring weather this past weekend! Much of our days were spent outside soaking up the sun and we loved it. One area of our home we love to spend time in is on the front porch, especially this time of year. With that being said, the front porch was is in much need of a little refresh. 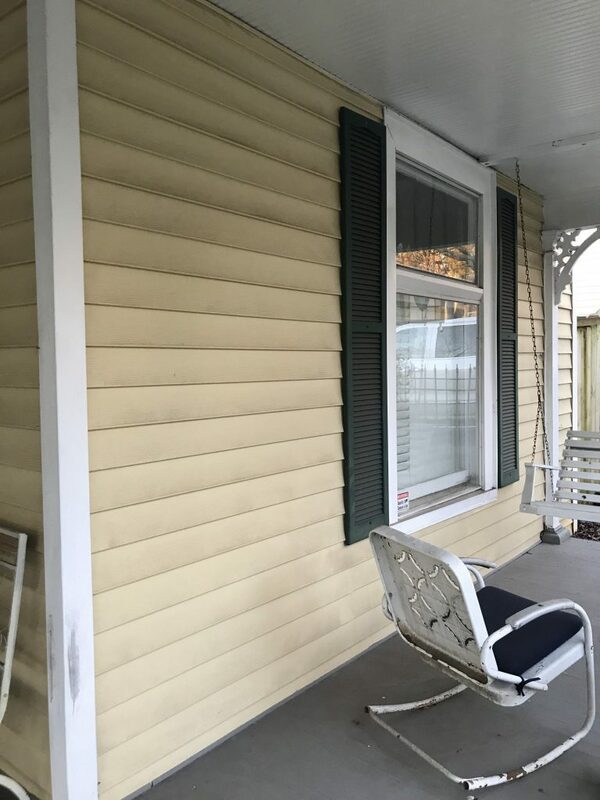 The exterior of our home is yellow, which I love, however the shutters had been painted a hunter green that in our opinion just did not match the house. Also, the front porch floor was in need of some repair and new paint as well. On Wednesday we’ll be showing you our Spring front porch decor. Today, we wanted to share with you the front porch before, as well as the paint we selected to use. Fair warning, the front porch was a little sad. Please do not judge haha. It seemed no matter how many times we cleaned the porch, we could never really get it cleaned. Which is evident in the above photo where you can see the outline of the welcome mat. Again, no judgement zone lol. We’re fairly certain they did not put a sealant down when the previous owners painted the porch. It’s a little hard to tell in the photo, but I assure you, the shutters were a dark hunter green. I love the color, but it just didn’t fit with our aesthetic. See what I mean when I say it was looking sad? Everything was so muted and I was ready for a change. It is something that had been on our list from the time we moved in. 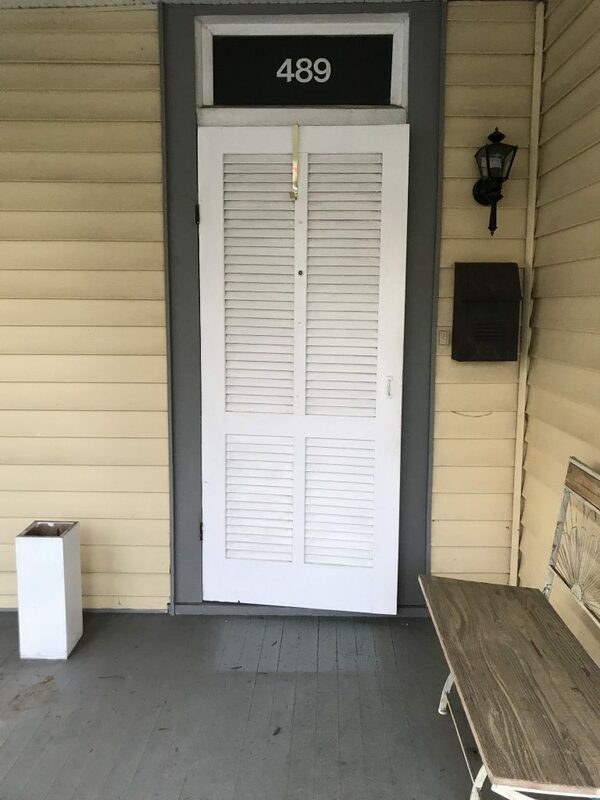 I was so excited that we were able to tackle the front porch refresh this year! For paint selection, I knew I wanted to go with a dark gray. I ended up going with Sherwin Williams Sea Serpent. It is a little more blue then I thought I would have chosen, but I fell in love with it. It pairs really nicely with the yellow, which you will see on Wednesday. We also painted the front door this color and it adds a pop of color in my life I didn’t know I was missing. For the porch floor, it had been a lighter gray, but I wanted to go with something slightly darker. We settled on Sherwin Williams Granite Peak, which really compliments the Sea Serpent. We’ve got a few big projects we want to tackle on the house and this was the first one off the list. And it feels so good! We can’t wait to show you the after of the front porch refresh, so be sure to check back in on Wednesday.